Research from a recent Gallup-Purdue study found that women who are former student athletes are 48% more likely to be engaged at work, compared to their male counterparts who are 38% likely to be engaged. One firm who understands the positive impact sports have on career success is professional services firm EY, formerly known as Ernst & Young. Among their 400 female executives from five different countries, EY found that 52% played sports at the collegiate level, compared to 39% of women at other management levels. Beth Brooke-Marciniak, global vice chair of public policy at EY, says that women who were student athletes often adopt skills of resilience, perseverance and team work, which serve as great assets in the workplace. 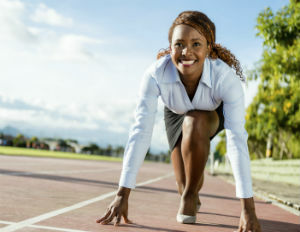 “You ball all of this up and it makes for female athletes to be very confident because they have all the ingredients to know how to succeed,” Brooke-Marciniak tells BlackEnterprise.com. Brooke-Marciniak, who played basketball at Purdue University, formed EY’s Women Athletes Business Network where each year they pair 25 elite female athletes with top business leaders to help them transition to a successful career outside of sports. As a sponsor of the 2016 Olympics in Rio de Janeiro, Brooke-Marciniak said she and other EY executives noticed that there was an incredible pool of untapped and undervalued talent of women in the sports world. Angela Hucles, who is a two-time Olympic gold medalist and two-time World Cup bronze medalist for the United States soccer team, is a mentee of EY’s Women Athletes Business Network and says she knows first hand how valuable and transferable the skills you pick up in sports are.